Miroslav Volf. After Our Likeness: The Church as the Image of the Trinity (Sacra Doctrina). Grand Rapids: Eerdmans, 1998. I picked this up to help with a sermon on the Church and Trinity (and it did come in handy recently too, with the ReImagining Church series) and just finished it… finally. It proved to be a very, very helpful piece. It’s dense, thorough, and heavy packed (less than 300 pages, but very intense in the amount of content packed into those pages). I admittedly had only had limited interaction with Volf’s works prior to this, but the small amount of interaction was always positive, and his reputation for being engaging and wise had me confident going into this book, and I was not disappointed. In Part I Volf lays out the perspectives of Cardinal Ratzinger (later Pope Benedict XVI) and John Zizioulas (Eastern Orthodox Metropolitan and Bishop of Pergamon) with regard to the Church, personhood, sacrament, ecclesiality, etc. Thus, Volf generates a “conversation” between Catholic, Orthodox and Protestant depictions of the Church. Part II is where the really helpful stuff lies (for the pastor at least), as Volf interacts with Free Church, Reformed Tradition, and the Catholic/Orthodox perspectives outlined in Part I to unpack the nature of the Church (and churches) and how they interpret catholicity, trinitarian participation and reflection, structures/offices, etc. (the chapters include: “The Ecclesiality of the Church”, “Faith, Person, and the Church”, “Trinity and Church”, “Structures of the Church”, and “The Catholicity of the Church”). Volf brilliantly takes the strengths from various perspectives, and critiques the weaknesses with grace. Volf upholds a view which is a sort of “in between” view of catholicity. The Church is catholic, and each local congregation is catholic in some sense, participating fully and completely in Christ. Though all parts are diverse the church is a “differentiated unity” or a “heterogeneous totality” (borrowing from Thomas Aquinas); a unified collection of diverse parts (261-2). The Church, argues Volf, is bound by the confession of faith that “Jesus is Lord” (145ff). This, argues Volf is declared and participated in (“a person gains access to salvific grace” ) through the sacraments (baptism and the Lord’s Supper). Thus the requirements of the Church to be the Church are public mutual profession of faith in Christ, identification with Christ as Lord (“commitment of believers to take the path of imatatio” ), “preformative” confession (149), and the sacraments. Volf is respected in a whole host of different circles/traditions. He is able to speak with integrity, grace and influence to various audiences, and be received cordially in various communities of faith (even being known as a key voice in interfaith relations, writing and editing several works on Christian-Muslim dialogue). His conciliatory tone has allowed him to welcome various perspectives into an honest discussion, and he is able to draw from differing views to create a beautiful image of the Church as a beautiful mix of varied persons connected by a mutual observance of Jesus Christ as Lord. Volf’s reputation is one of praise for his ability to generate honest, respectful, ecumenical discourse. This volume certainly lends to that reputation, as it is in itself an ecumenical project. Volf is both a passionate, practical, interactive, even pastoral person, but also an accomplished scholar. Both sides comes through in After Our Likeness. It is an intensely researched tome, showing Volf’s abilities as a researcher, exegete, and systematic thinker. He capably handles difficult concepts (like the relationship between catholicity and individual personhood) and presents them with precision. He shows his capabilities in systematizing thought well, breaking the discussion into a well laid out argument. The intensity of the research is remarkable (over 20 pages to the bibliography) as is the vast diversity of sources which Volf draws from and interacts with. The integrity with which Volf has presented various opinions and evaluated claims is commendable. Volf has created a piece of work where various voices are heard, integrated, and become parts of a beautiful whole. The way in which the book is written even backs up the thesis of a varied but united whole; multiple, varied voices coming together to create a harmonious depiction. If only the whole of the body of Christ would “buy into” Volf’s symphonic picture of the Church. The key issue for me is that there are many parts which are invaluable, while others are partially unnecessary, or at least prolonged and perhaps hide the more helpful portions. Part I is a tad dry, and difficult at times. It is needed to a degree, laying foundational depictions, which the later chapters interact with and reference the preceding groundwork. But it does cause the book to drag somewhat, especially since the book leads with this. It could have been leaner in this section. The only other qualm I have is the lack of a concluding chapter to provide some closure. Because of the denseness, I was reading over a longer period of time, and would have liked a chapter at the end to “sum up”. The book is dense, so not for the timid. Most laity would get bogged down and lose interest. This is more for grad students, pastors, and trained denominational leaders. The back cover blurb on the series (Sacra Doctrina: Christian Theology for a Postmodern Age) suggests it is aimed also at “educated laypeople” which may be the intent of the series, but this volume may be for only the most educated among the laity. That being said, I thoroughly enjoyed it. 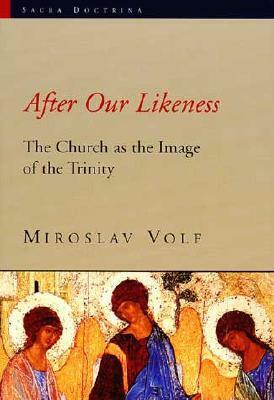 Volf sets a beautiful vision for the Church as a place where individual persons meet as one through the confession of faith in Christ as Lord, reflecting the image of the Trinity as three persons, sharing one nature bound in perfect love. Volf’s research presents a Church where the gracious and loving nature of a God who has distinct persons is actualize in the diverse but unified assembly of people serving one Lord, sharing in one Gospel, and recognizing one holy, catholic and apostolic body. Volf gives us a model of how diverse opinions within Christianity can be drawn into one place, sit at one table and whose differences can become a symphony of diversity which come together to become one masterpiece in the hands of the gracious and infinitely creative composer. This entry was posted in books, church, New Testament, practical theology, theology, trinity. Bookmark the permalink.